Thanks to Radio Cardiff, Motown Junkies now has a radio show: we proudly present “Discovering Motown”. Tune in online from 3-5pm UK time (10am Eastern, 7am Pacific) every Sunday via http://tun.in/seM37. All episodes are available online free forever – click any image to listen to that episode right now! The radio show dedicated 100% to classic Motown returns with another hand-picked selection of hits and rarities from the world’s greatest label. Another hand-picked selection of red hot Detroit rarities and classic grooves from the world’s greatest record label. 67 hours in and this is still one of my favourite playlists so far! Motown historian Steve Devereux presents another hand-picked selection of hits and rarities. Another hour of Hitsville hits and history from the dedicated Motown show. 3. I've Given You The Best Years Of My Life - P.J. The 100% classic Motown radio show. Historian Steve Devereux hand-picks the hits and rarities from the world’s greatest record label. The 100% classic Motown show continues. Historian Steve Devereux presents another hand-picked selection of big hits and classy rarities from the world’s greatest record label. Enjoy! Motown historian Steve Devereux returns with another hand-picked selection of rare and soulful cuts from the world’s greatest record label, including a special Jimmy Ruffin tribute. Steve Devereux presents another hand-picked selection of Motown’s big hits and hard-to-find classics. Enjoy! Motown historian Steve Devereux presents a special bonus Christmas episode of the 100% classic Motown radio show, featuring some of your festive favourites from Hitsville, plus holiday greetings from Motown stars. Motown historian Steve Devereux presents another selection of Detroit specialities: the usual mix of big hits and hard to find classics, plus a WORLD PREMIERE for 1964 tracks by Marvin Gaye and Hattie Littles from the (then-) upcoming Motown Unreleased 1964 compilation. Enjoy! Motown historian Steve Devereux presents another selection of Detroit hits and rarities, including a great opening 1-2 punch especially for anyone who was worried we’d run out of hits by now. Enjoy! Motown historian Steve Devereux starts a second 50 hours of the classic Motown radio show, with the usual mix of hand-picked hits and rarities (and some new artwork!) – enjoy! Motown historian Steve Devereux presents a special 50th episode of the 100% classic Motown radio show, featuring the usual mix of big hits and hard to find classics, plus some personal favourites. Motown historian Steve Devereux returns with more big hits and hard to find 60s/70s soul classics from the Detroit vaults for your listening pleasure. Motown historian Steve Devereux returns with even more hand-picked hits and rarities from the world’s greatest record label. Motown historian Steve Devereux returns with even more hand-picked hits and rarities from the world’s greatest record label. 47 hours in, and just look at the quality of these tracks we haven’t played yet! Motown historian Steve Devereux returns with more hand-picked hits and rarities from the world’s greatest record label. The strength in depth of Motown in full view here – 44 hours in and it’s only now we play Baby Love. Motown historian Steve Devereux returns with more hand-picked hits and rarities from the world’s greatest record label – this time featuring three exclusive BRAND NEW never before heard tracks from the forthcoming Satisfaction Is Guaranteed: Motown Guys compilation! Motown historian Steve Devereux presents another hand-picked selection of hits and rarities. And some fairly major technical problems. More hits and rarities, including some Sixties gems from Motown’s early days. Enjoy! Another hand-picked selection of hits and rarities from Motown’s golden era. Have fun! June is upon us (how?! ), and so I’m back on the airwaves with another hour of Motown crate-digging. Yet again, I can’t really believe I get to play some of this stuff on daytime radio, but the response has been amazing. Enjoy! Another selection of red hot Detroit rarities and classic grooves from the world’s greatest record label, specially selected for you by Motown historian Steve Devereux. Whether you’re new to Motown or a seasoned veteran, you’ll find something good here. More classic Motown selections from Steve Devereux, who this week (after a short old-school interlude) is looking at some standout cuts from the early Seventies. Steve Devereux picks some more of Motown’s best records of the 60s and 70s, from million-selling 45s to obscure B-sides and unreleased cuts. Hitsville USA quality all the way through! Writer and historian Steve Devereux picks another brand new selection of his top Motown hits and rarities for you, this time including a couple of little-heard Hitsville blues cuts. Enjoy! Writer and historian Steve Devereux gets April off to a bang, digging in the Motown crates to bring another weekly dose of big hits and hard to find classics, from the obscure to the unavoidable. More classic Motown selections from writer and historian Steve Devereux, who this week was feeling a little bit Northern. Even more than usual, that is. The weekly classic Motown radio show returns with more big hits and hard to find classics. The only weekly radio show (that we know of!) dedicated 100% to classic Motown returns with another selection of hits and rarities from the world’s greatest record company. 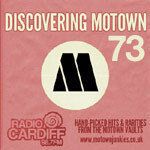 Wales’ best (well, only) dedicated Motown show returns with another hour of Motown greats and discoveries. (The first hour of…) another live radio show filled with Motown hits and rarities, carefully selected for your enjoyment. Hour one of our second weekly show, in which we reach into the stacks and pull out some rare treasures along with a generous helping of big hits, as well as a few listener requests. The second hour of the show, recorded as a stand-alone episode for midweek repeat. Again, plenty of super Motown cuts, both well-known and not so well-known, including rarely-heard versions of tracks by the Supremes and the Velvelettes. Our first live episode! Or the first hour of it, anyway. The second hour gets repeated as a standalone show on Wednesdays, so I can’t upload it until then… but there’s plenty of big hits and classy rarities here to keep you busy! Paying tribute to the songwriting genius of Smokey Robinson, Motown’s go-to hitmaker in the 60s and early 70s. Hard to narrow the great man’s career down to just one hour – I hope you like some of my choices!